This is one of the prettiest dorids on the Pacific coast of North America. Its bright orange papillated dorsum covered with yellow specks make it pretty hard to miss. It is also the largest of the north Pacific acanthodorids, reaching over 30 mm in length. Acanthodoris lutea feeds on encrusting bryozoans. It turns the chemicals received from the bryozoan food into a noxious metabolite that is toxic to other species (Morris et al. 1980). It is therefore not surprising that this species would be aposomatically colored, warning predators of this deterrent. If you handle this species you can smell this chemical on your fingers, which has the pungent essence of sandalwood. 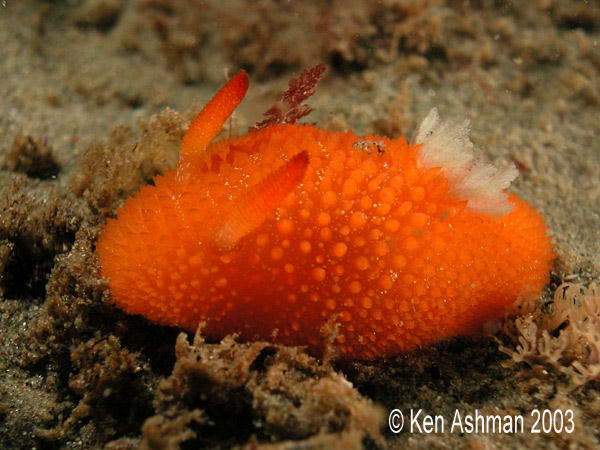 This dorid, which gets the name "lutea" from its color, is common both in the intertidal and subtidal from Arago, Oregon to northern Baja California, Mexico (Behrens, 1991; Goddard, 1997). Ken's fantastic photo here was obviously a subtidal shot, taken at Santa Rosa Island at 40ft., using a Nikon CoolPix 5000 in L&M Tetra housing with dual YS-90 strobes, ISO 100 - 1/250th - F7.8 - lens @ 20.1mm (all manual control including Focus). You digital folks are too much. Thanks Ken. Goddard, J.H.R. 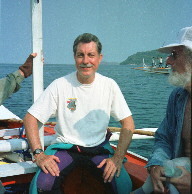 (1997) Range extensions of eight northeastern Pacific nudibranchs. Opisthobranch Newsletter, 23: 13. Morris, R.H., D.P. Abbott & E.C. Haderlie (1980) Intertidal Invertebrates of California. Stanford University Press: Stanford, California. "...My goal in doing nature photography is to tell the animal's story. I want to show the creature as artfully as I can, within its natural setting. There's a well-known maxim: "photographer's are artists who paint with light". Techniques I learned doing weddings and portraiture work just as well in U/W nature photography. Sharply angling the highlight-light creates a tactile effect - makes it so you can almost feel the animal's skin..."